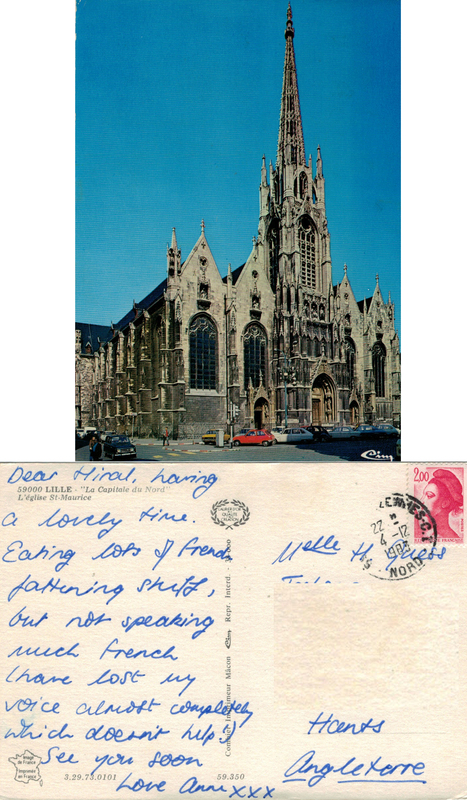 The card features L’église St Maurice in Lille, which, on the reverse of the card, is described as the capital of the north [of France]. 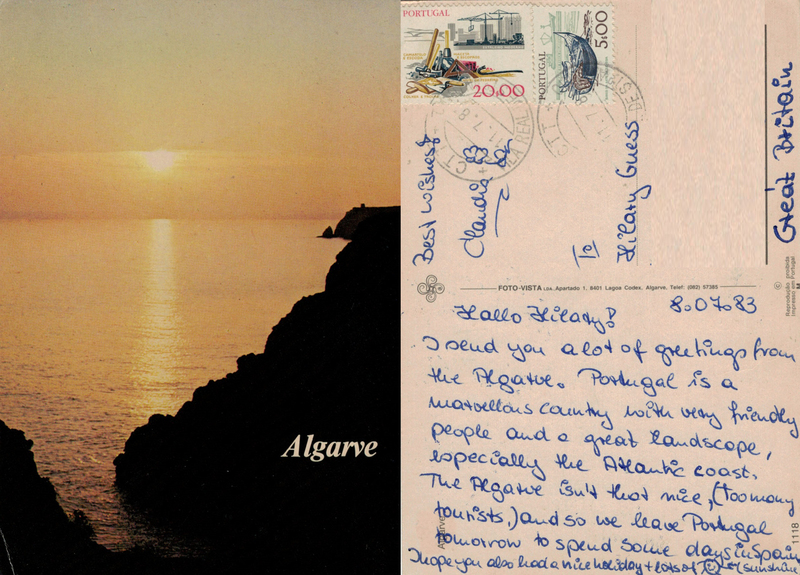 It’s Postmarked ’22h 4-12 1983′ and carries a 2 franc Liberté de Gandon stamp which was issued in 1983. 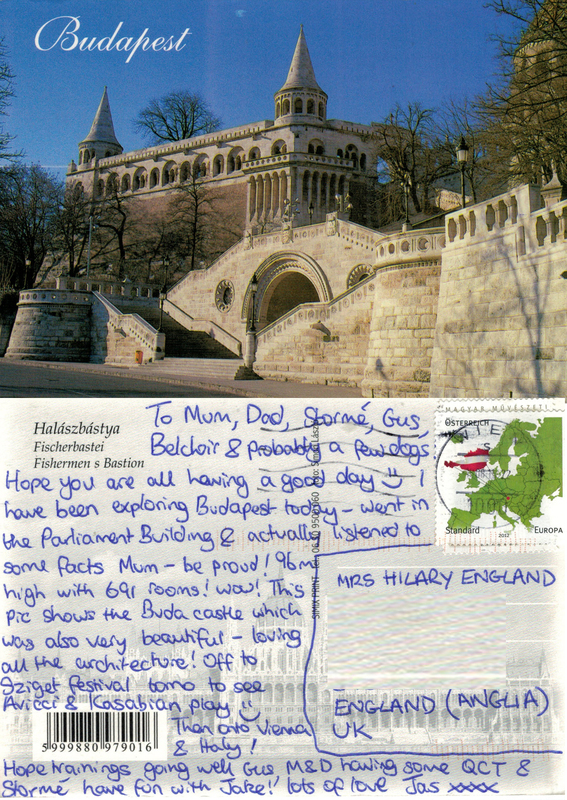 See how, as she’s in France, Anne has used the French form of address – M’elle, short for Madamoiselle or ‘Miss’ – that’s a nice touch! The message gives little away – why was she there in December? Who, if anyone, was she with? 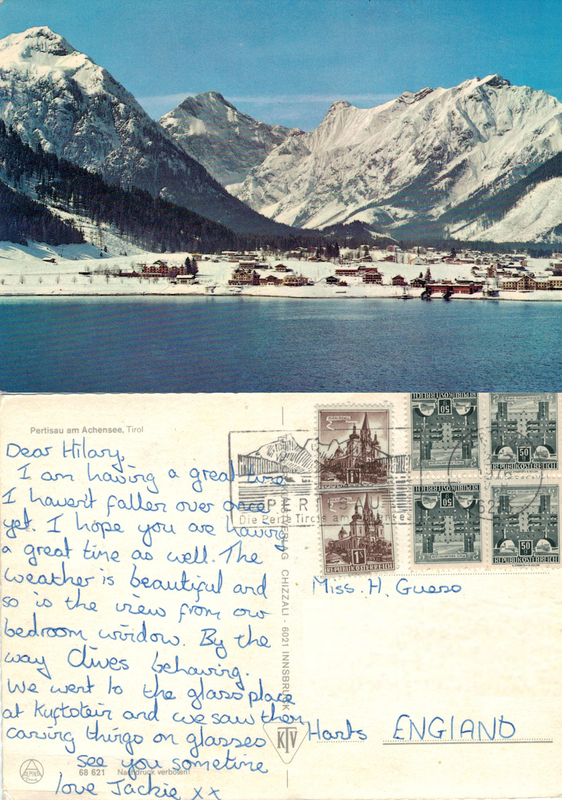 To Hilary, Thankyou very much for the lovely birthday card you sent me, I have forgotten exactly when your birthday is, I know it is soon so please will you let me know. My mum sends your mum her love. I am going to Wadhurst College as a boarder on Sept 10th Have fun Ida. The text on this card offers no clues about a trip to The Cotswolds; 790 square miles of outstanding natural beauty in South West England. 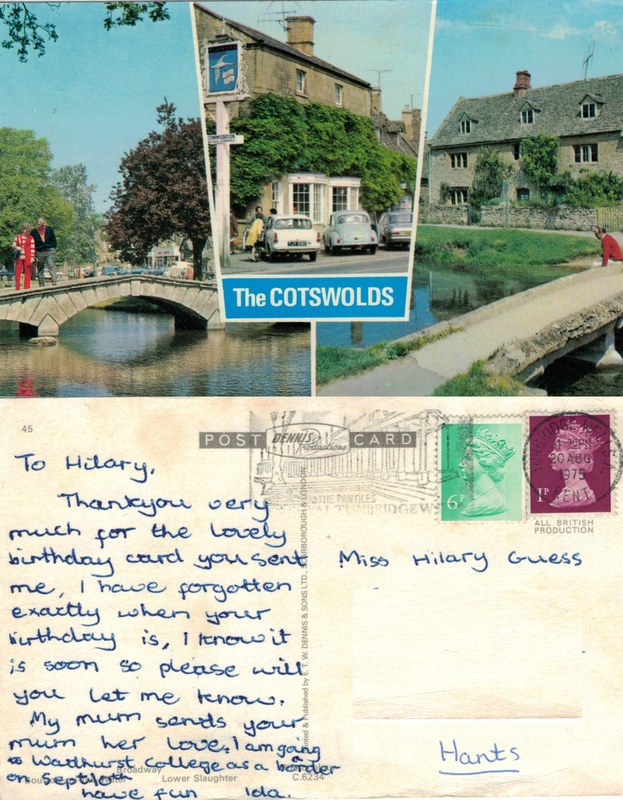 Indeed the card wasn’t even posted from The Cotswolds as it bears a very clear ‘Tunbridge Wells 1.30pm 20 Aug 1975 Kent’ postmark. This carries the postmark ‘TZABPOY 24.08.15’ which I have identified as the tiny hamlet of Tzavros on Corfu, Greece. The stamp is very colourful featuring an underwater scene and is part of a set issued in 2015 entitled ‘Diving Tourism’, promoting Greek tourism and the diving opportunities to be found there. 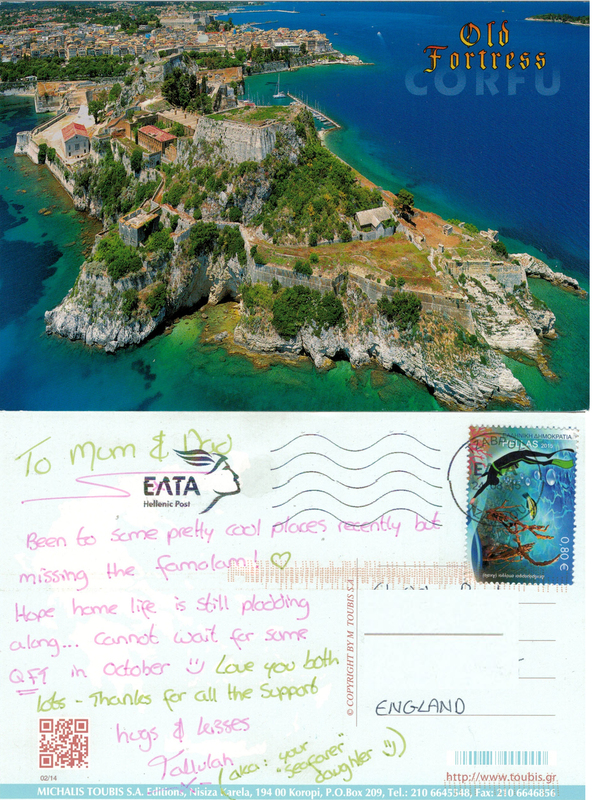 The picture on the front is self explanatory featuring the old town and fortress of Corfu which is a UNESCO World Heritage Site. The use of symbols and punctuation identifies this as a 21st century message which is simply ‘missing you and looking forward to seeing you’. Tallulah is my daughter who travels the world working as a super yacht deckhand; this billionaire industry is jaw dropping… Tallulah loves being on the water and her trips home are becoming less frequent. However, in October 2015 we did enjoy QFT (quality family time) when she was back for a few weeks. Home life does, indeed, plod along – that’s the beauty of home; always there and always more or less the same – enduring security and insurance for the traveller! Like all daughters Tallulah is beautiful; I love her unconditionally and I am very proud of her.